A woman is dead and three others are injured after a trucking accident on Interstate 90 near Cle Elum on Monday, according to the Washington State Patrol. State Patrol said the semi-truck was hauling a trailer and was trying to switch lanes to avoid slowing traffic ahead just after 3 p.m. The semi rear-ended a car, which then spun and hit another vehicle in front of it. Both cars were forced off the road. A Quincy woman died at the scene of the crash. Three others were injured, including one critically. The driver of the semi-truck was not injured. Because damages can be so high in cases such as the one above, trucking companies have a strong incentive to fiercely defend claims. If the truck driver was at fault, it’s important that information be collected quickly and the right questions be asked. Do the driver’s logs show that he or she had the proper amount of rest before the accident? Was the truck traveling too fast or driving recklessly for conditions at the time of the crash? Does the driver have any history of violations on the road? Were drugs or alcohol involved in the crash? 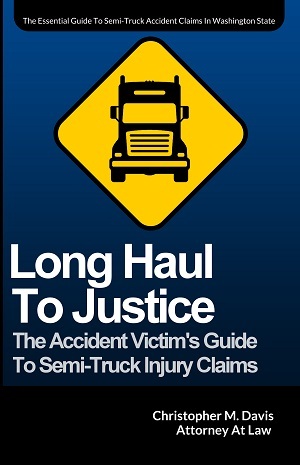 A personal injury lawyer would have the knowledge to check the trucker’s log book and see if there are any discrepancies. The lawyer might also check the GPS to see if the log book is accurate, as well as look into the driver’s history to see if there are any previous incidents of tampering with the log book.